Get a burst of energy that keeps you going all day. Includes a detachable USB-C fast speed charging cable and you can use it on any USB-C compatible Android smartphone/tablet. • Charge fast. Over and over. Turbo charge your mobile smartphones and tablets without decreasing your battery’s lifespan thanks to the optimized battery charging algorithm and Qualcomm QuickCharge 3.0 technology. • One for all. Charge any single USB or USB-C enabled mobile device. TurboPower™ supports a wide range of profiles that can take advantage of blazing-fast charging speeds. • Charge safely. Rest easy. Get built-in protection from power surges, extreme heat, and other dangers, and know your smartphone or tablet will remain safe while charging. • Ideal travel companion. The sleek and compact design makes this charger a perfect portable charging companion whenever you are on the go. • High Energy Efficiency. Part number SPN5972A (EAN: 6955226407468) with Level VI high energy efficiency compliance. • Environmental friendly. Features include PVC free, BRFs free, lead free, Phthalates free and RoHS compliant. • Includes a 1-meter detachable USB-C fast charging cable. You can use it with USB-C compatible mobile smartphones, tablets, digital cameras and more. * Not all devices will charge at the same rate. Some devices may not be able to utilize the full 15 W. Charging rate reduces as charge levels become full to protect battery life. 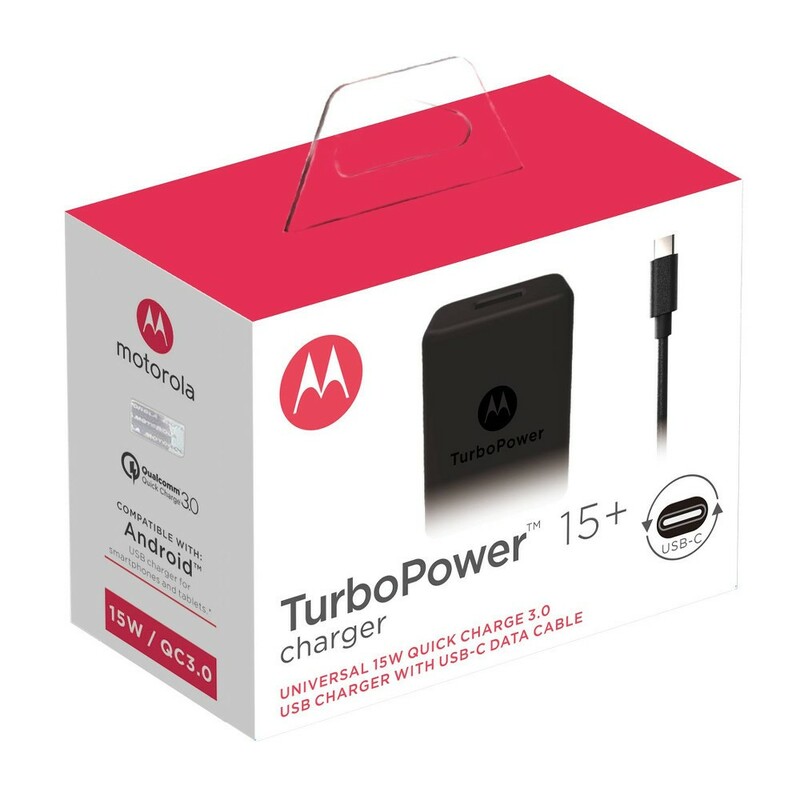 It works with USB-C compatible devices including Moto Z family phones, Moto G6 Plus, Moto G6, Moto X4, and Moto M.
Does this charger work with Moto G6 play? No. The charger here comes with a USB-C cable. Moto G6 play has a micro-USB port. Please select the charger that comes with a micro-USB plug cable. The output depends on the ability of your device,so 15W may not be fully utilized. Charging voltage is dynamically and smoothly adjusted over the battery charging cycle for Quick Charge QC3.0 devices. Once the device is charged to 100%, it will enter standby mode. The short answer is, it depends on the length and the quality of the cable used. The original Motorola data cable was specifically designed for this charger, so you would have to do some experimentation to find out if a different cable would work. As cable length increases, it becomes necessary for thicker gauge power conductors to compensate for voltage drop. If the thickness of the gauge power conductor is not increased enough to compensate the voltage drop, the turbo charge will not activate.